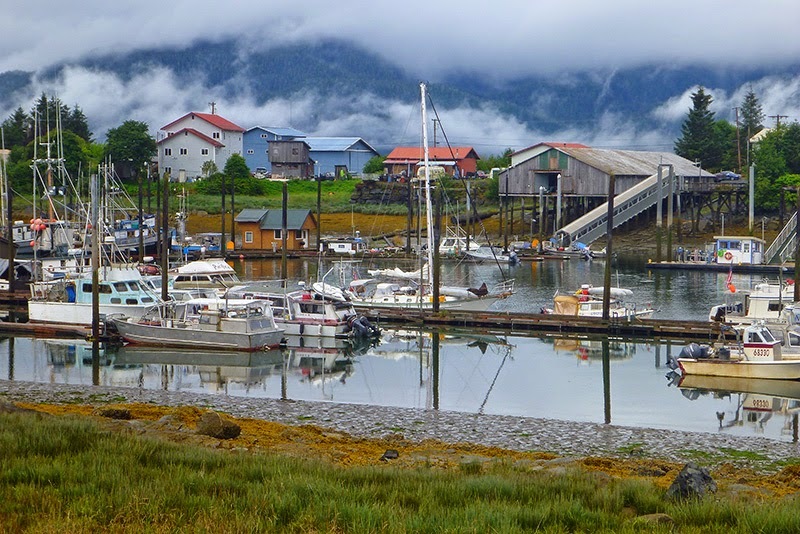 The region between Petersburg and Ketchikan is known, among Alaskans, as “the Banana Belt.” The moniker derives from the mild temperatures and warmer weather experienced here compared to the rest of Alaska. However, our initial experience of the Banana Belt did not live up to its name. We arrived in Petersburg just as a series of lows was entering the southeastern Panhandle. Although we had nice weather when we arrived in Petersburg, by the time we left, it was raining steadily. The rain was to continue for the next six days. 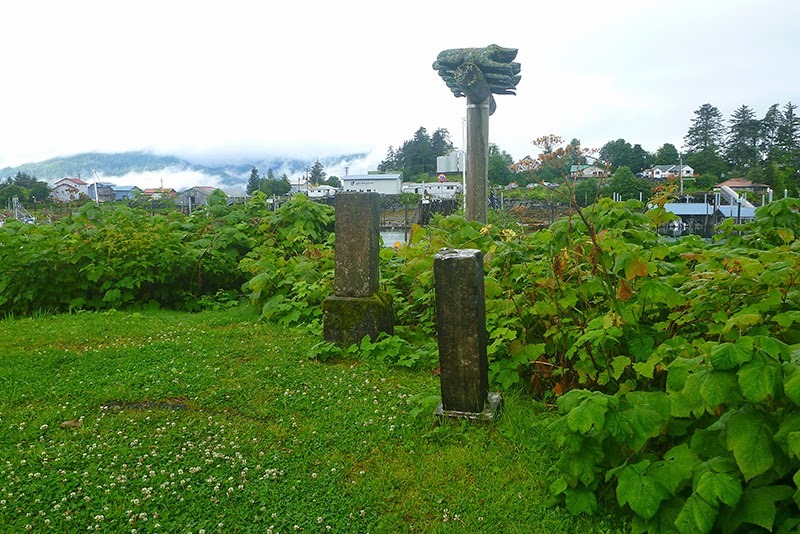 We could not seem to shake the damp, overcast weather that had made up the majority of our days since leaving Sitka. From Petersburg, we continued south via Wrangell Narrows. Wrangell Narrows is one of several narrows in southeast Alaska---named for their slim channels of deep, navigable water bordered by shoal depths on either side---but it is most famous for having over 70 navigation aids peppering its length. At night, it is known as "Christmas Tree Lane." 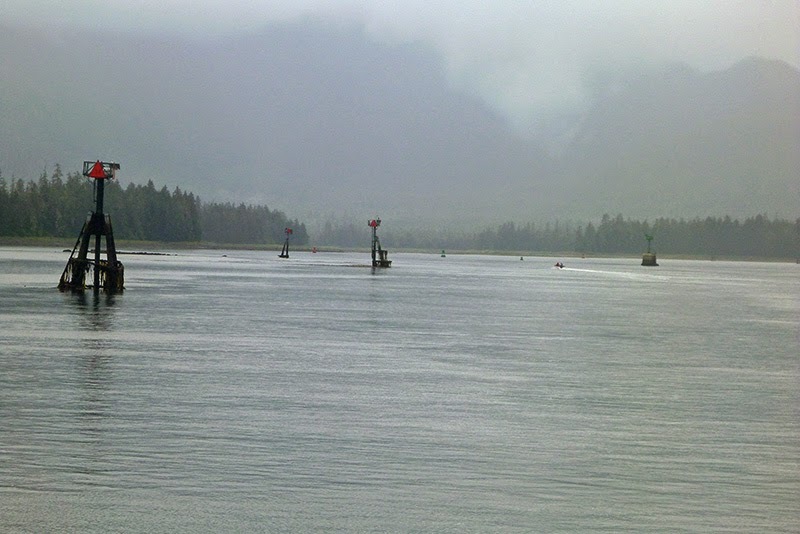 Wrangell Narrows is a manmade channel, dredged out to make a convenient north-south passage where none existed. Our goal for the day was to make it to Wrangell, but after transiting the 20-mile narrows in mostly rain and exiting to Sumner Strait---where we discovered our course to Wrangell lay in 20 knots of wind (and rain) on the nose---we decided to quite early for the day. We shut down the diesel, set the jib, and sailed on a reach across to St. John’s Harbor, where we anchored up for the night. The next day, we still had wind and rain on the nose; but we were refreshed, and we tacked Silhouette back and forth across the channel most of the way to Wrangell. 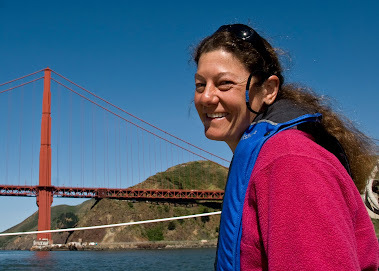 When the wind died, we motored in and took a slip in Reliance Harbor. 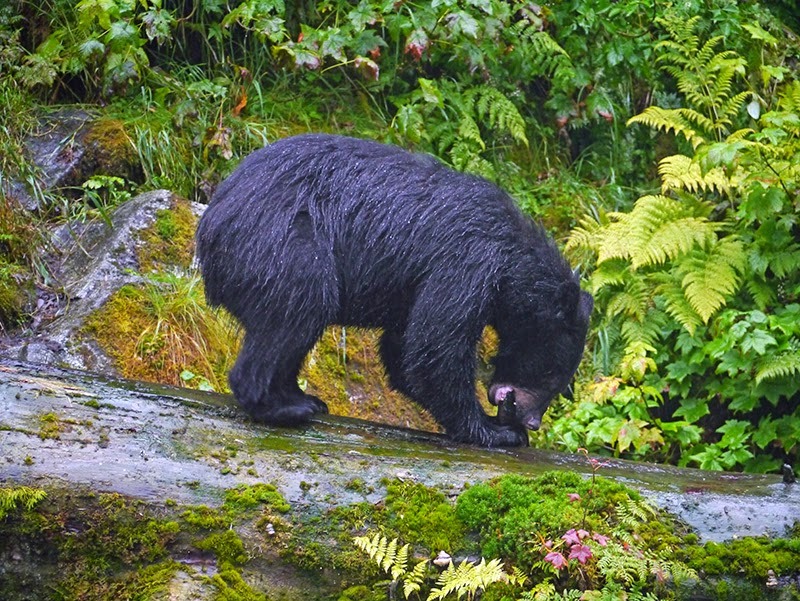 We arrived at the dock at 3:30 p.m. Unbeknownst to us (until the following day), at 4:00 p.m., Ray Troll was giving a lecture and hosting a poster signing in the Cultural Center as part of an annual, week-long event called “Bear Fest.” We arrived in Wrangell on the second-to-last day of Bear Fest, missed the key note speaker, and did not participate in the “fun runs” that comprised the main events during the last day of Bear Fest. 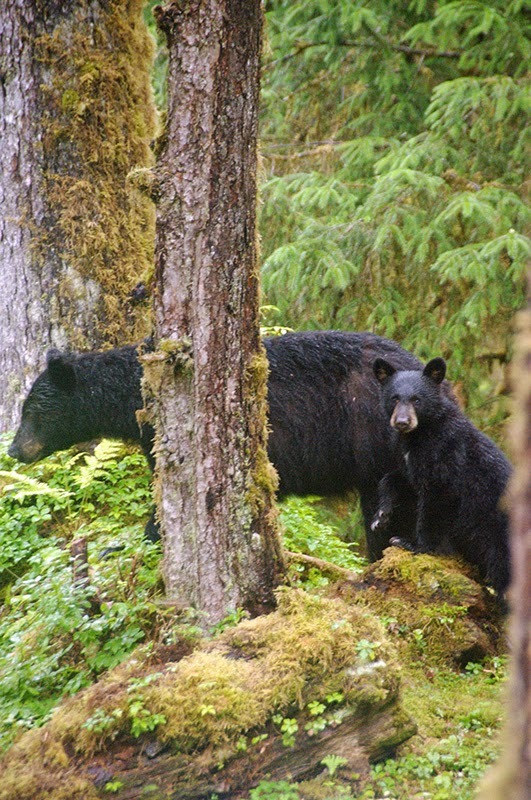 We were also unable to shop for groceries, as that last day of Bear Fest fell on a Sunday, when the two grocery stores in Wrangell are closed. Reliance Harbor is a working harbor with many fishing boats and few pleasure craft. We didn’t tour the newer harbor, New Heritage Harbor, which is farther from town. 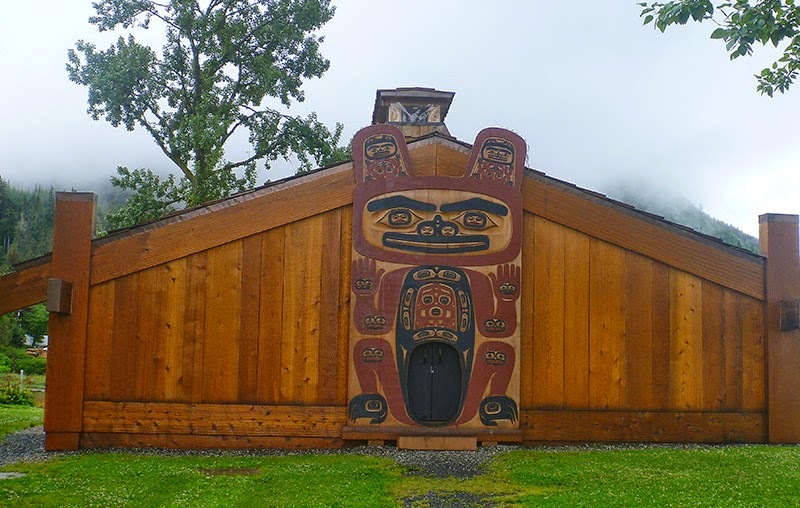 We visited Shakes Island and the Tlingit longhouse there. We only saw the outside of the longhouse, because the door was locked. 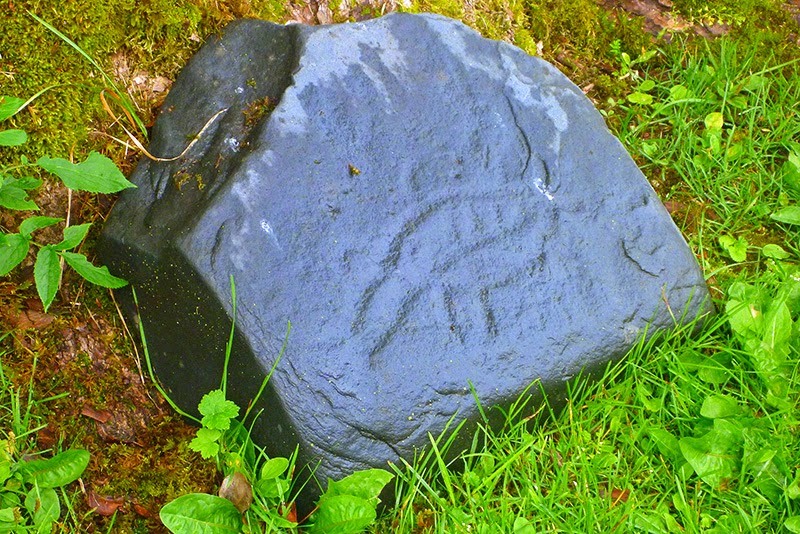 The interpretive sign Patrick remembered from a previous visit was missing, and it looked like the cultural site was under intensive restoration, as the Eagle and Raven poles that Patrick remembered as standing, were now prone, under the protection of sheds. 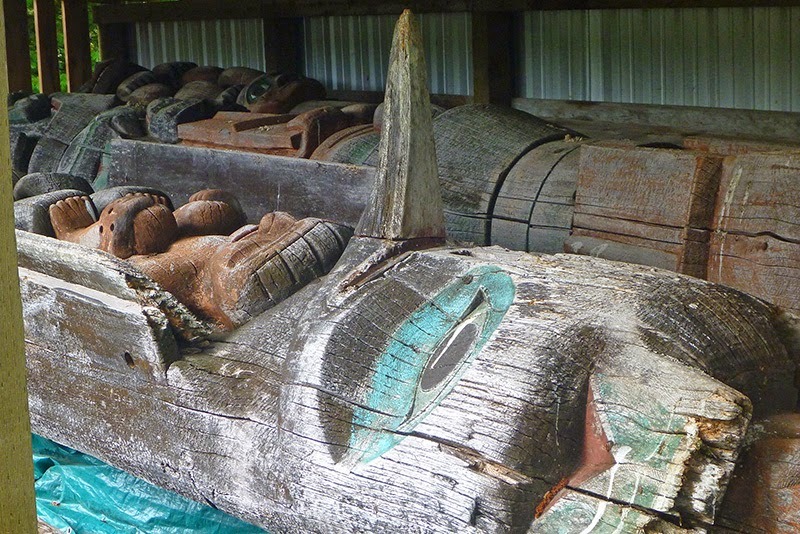 Seeing the totems in a horizontal position really gave you a sense of how tall they actually are. We followed the ranger’s directions and showed up first thing in the morning to see if there were any permits available for the day. (A limit of 60 people are allowed in to Anan Creek per day, and all the permits were booked when we checked the reservation calendar. However, like Glacier Bay, some permits are held in reserve for last-minute planning.) The ranger had told us to show up early; “First come, first served.” However, it turned out that they couldn’t tell us if any permits were available until noon at the earliest. A cruise boat was in at Wrangell, and our ability to obtain a permit depended on how many permits the cruise boat passengers used. We should have just stayed in the anchorage and called on the radio. After an hour and a half dinghy ride over to Anan Bay to be told, “Check back with us at noon,” we debated whether or not we should hang out for three hours or return to the boat. As the rain started falling, we decided to return to the boat. We got some chores done, and had basically decided to wait until the next day to try for a permit again, when at 1:20 p.m., we got a call from the rangers at Anan Creek. They had two permits available for the afternoon! So we dinghied the 6 miles back to Anan Bay in the pouring rain. After a brief orientation from a ranger, we hiked along the boardwalk trail towards the observation platform. The ranger below radioed the ranger above and told her we were on our way. When we first arrived at the creek, there wasn’t much action. 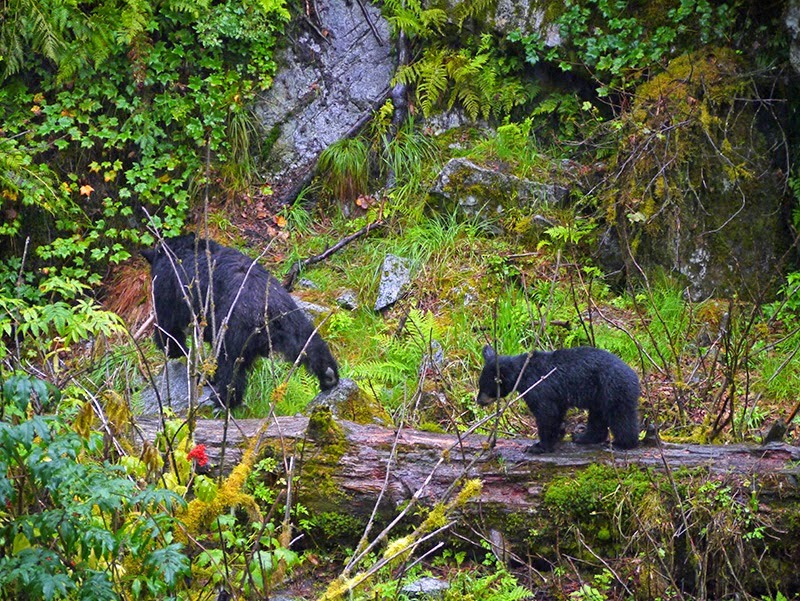 That morning, a grizzly with four cubs had been spotted catching salmon, and that afternoon, a grey wolf had been sighted. 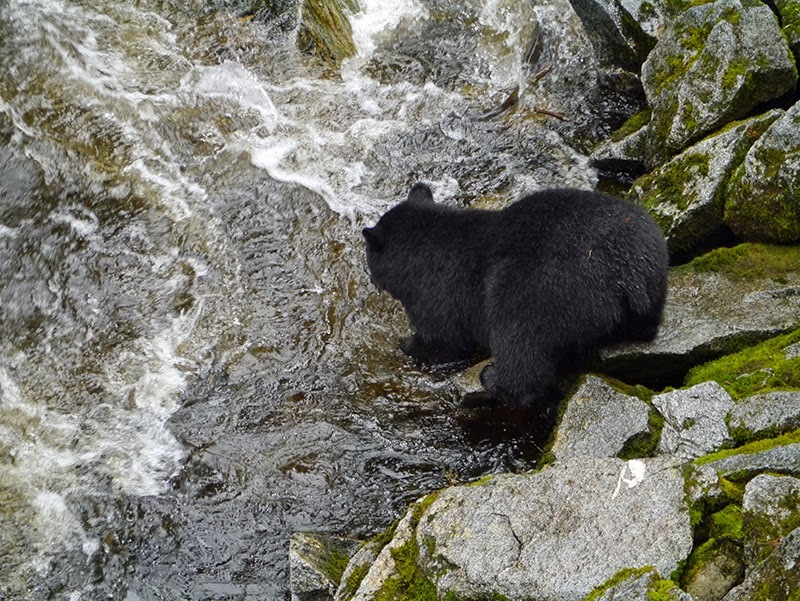 After a short while, a black bear, followed by another, and another, came to the creek to fish for salmon. 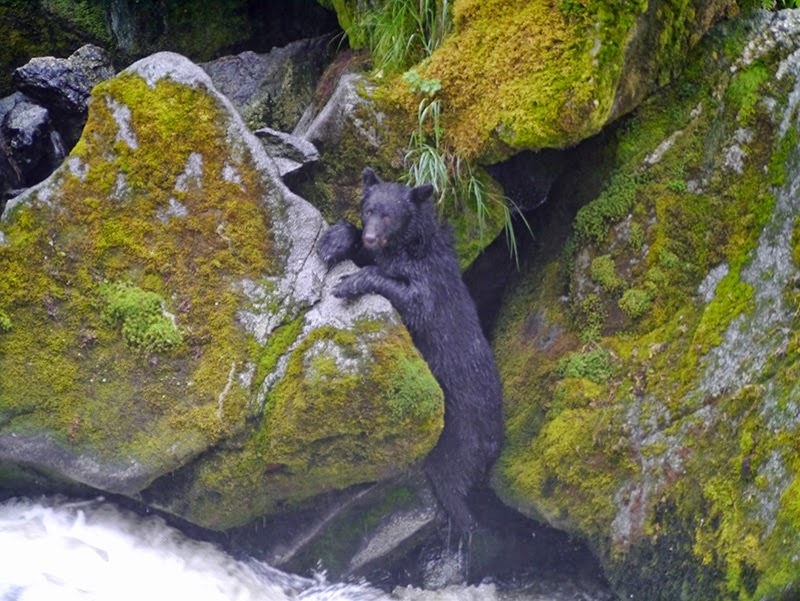 Soon, the place was crawling with black bears (though we never did see a brown bear), catching and feasting on the pink salmon trying to get upstream to spawn. 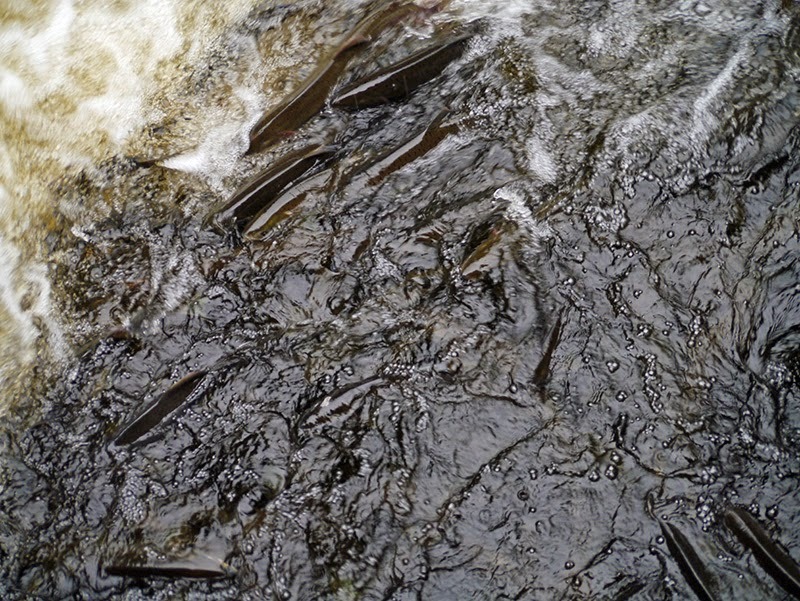 The creek was swollen with the heavy rains of the past few days, and the salmon had an even more difficult job than usual trying to get up the falls to their spawning grounds. 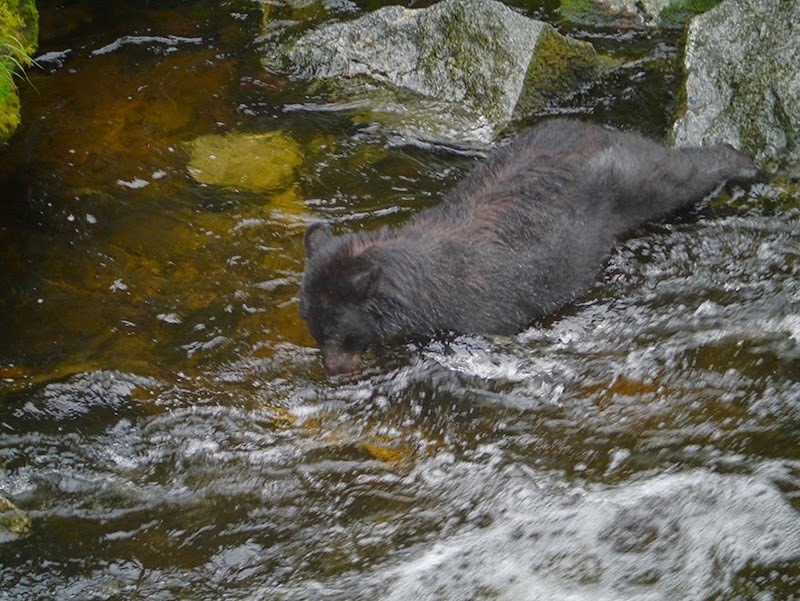 The fish tended to collect in eddies along the sides of the stream, where they were easy pickings for the black bears. It was fun watching the bears going fishing. At times, they had to get into some athletic positions or get a snootful of water in order to catch a fish. 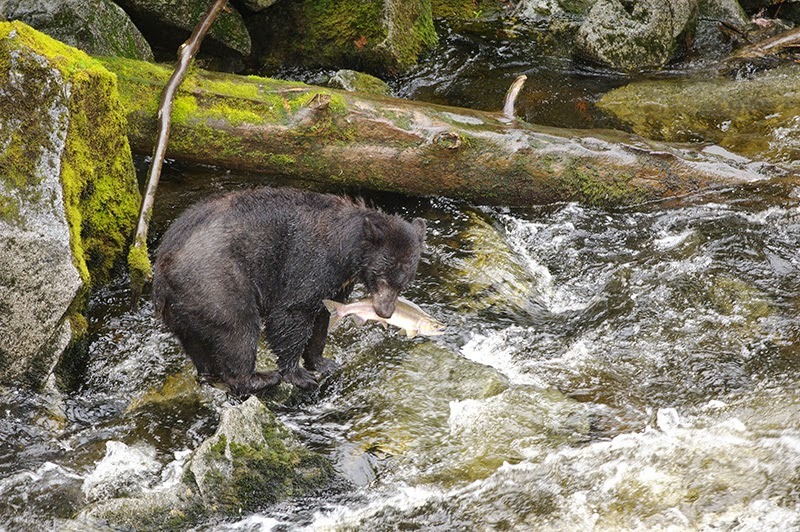 It was not so much fun watching the bears eat the salmon. 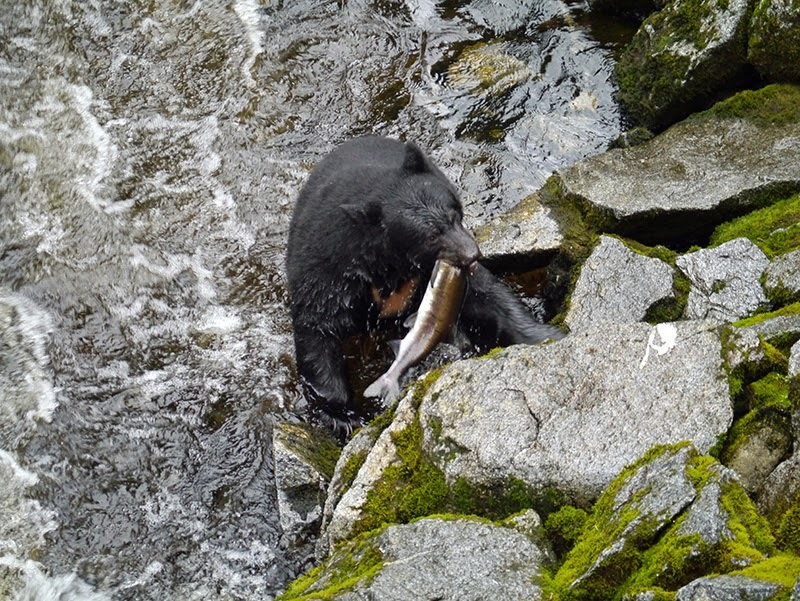 I came away from the experience more impressed with the salmon than with the bears. My god, those fish are tough! 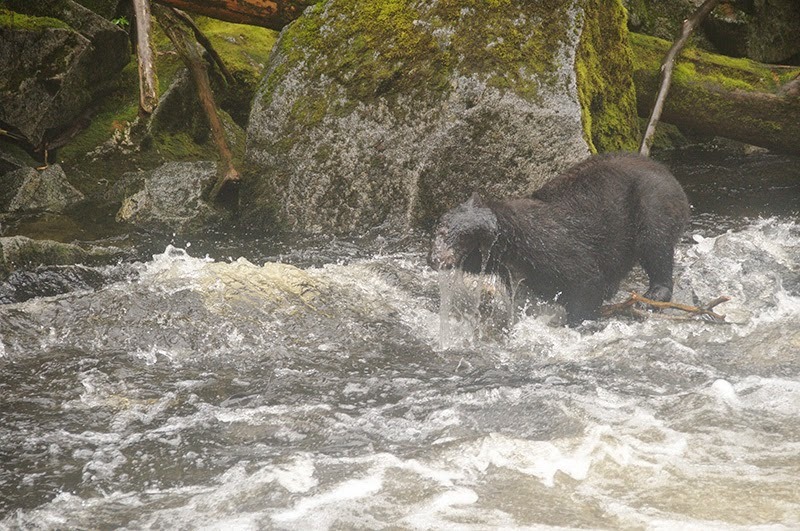 After exhausting themselves for hours trying to get up the falls to spawn, the salmon still had energy to fight when a bear was literally biting into their back or head. The drive to survive and reproduce is a potent one, for certain. As Patrick pointed out, a bear's life is not easy either. 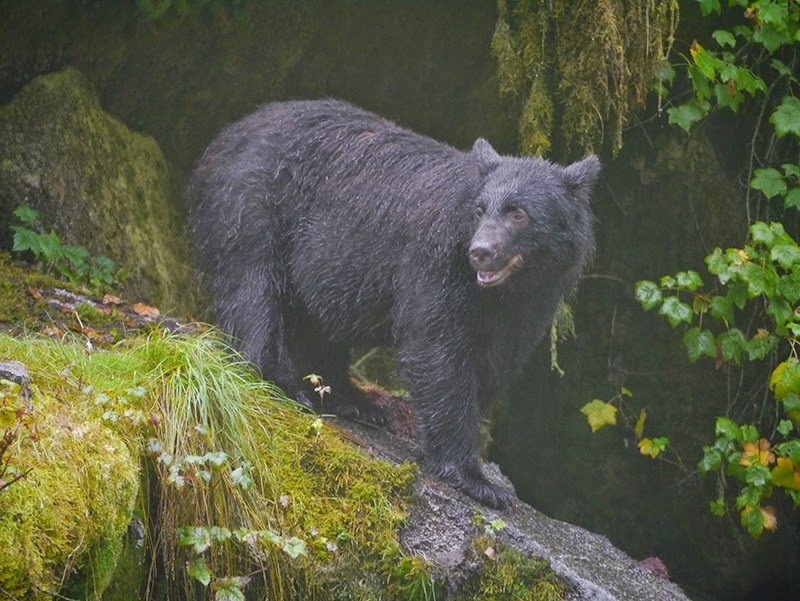 Most of the adult male bears were missing patches of fur, and their snouts were covered with battle scars. Another thing that impressed me about the bears was how gentle they were with their prey. They held it clumsily in their paws, they licked it, ---yes, they chewed it---but they did not tear at it viciously as one might imagine, growling all the while. 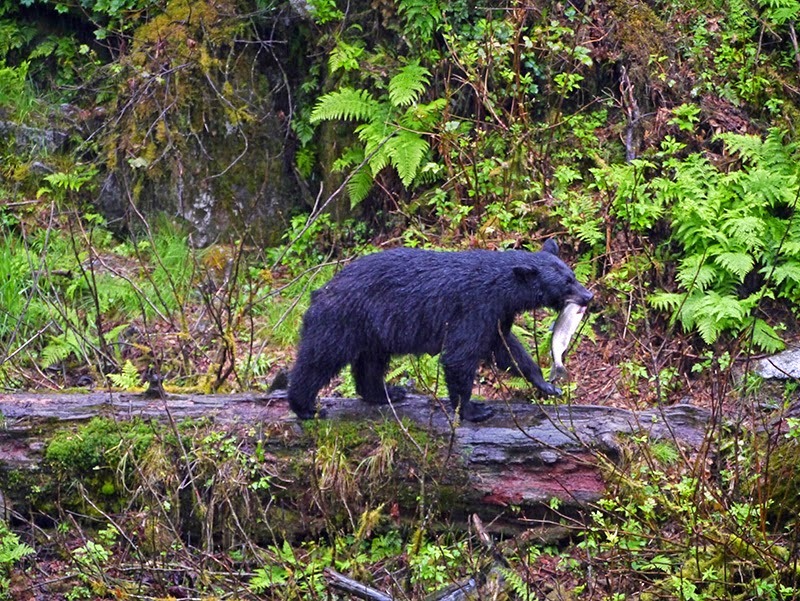 The ranger explained to us that early in the season, the bears ate the entire fish. 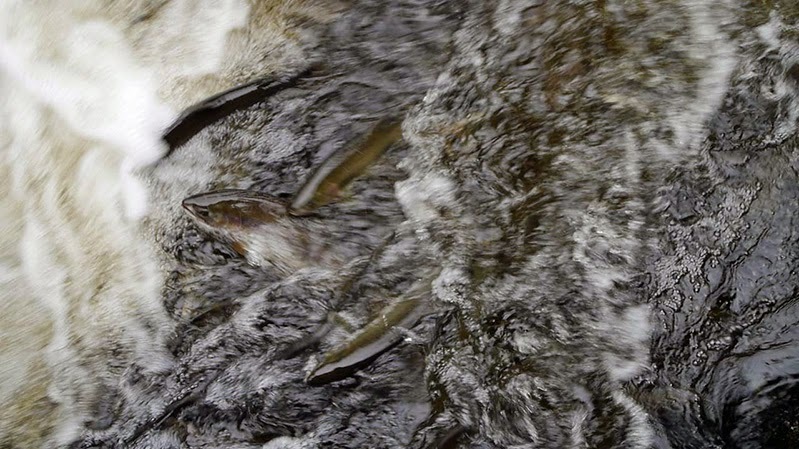 However, now that they are fat and well fed, and the salmon are still plentiful, they “high grade” by eating only selected (the best and fattiest) parts of the fish. 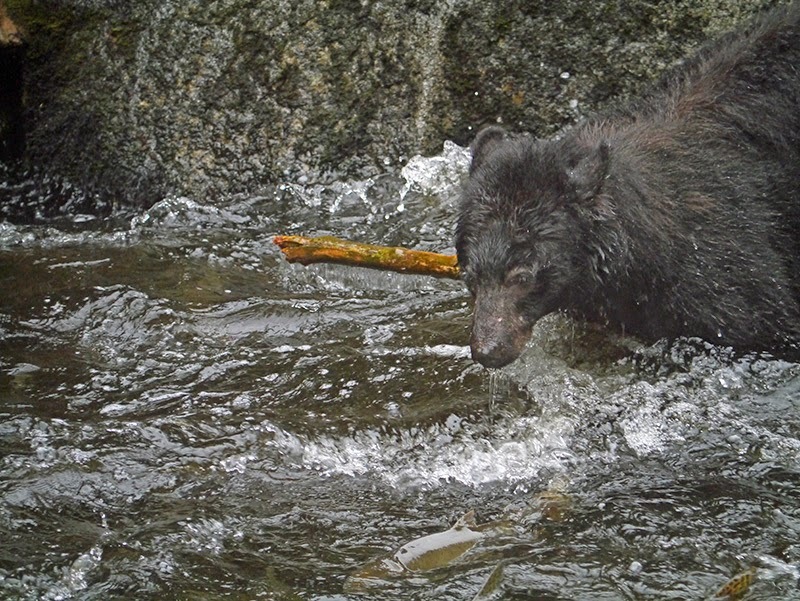 It seems wasteful; however, this ecosystem supports much more than just bears. 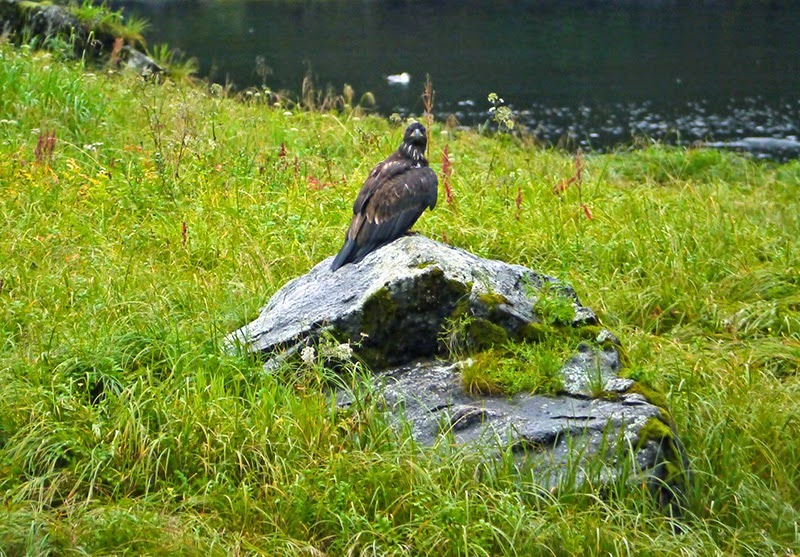 Eagles, ravens, and seagulls are all hovering in the distance, waiting to feed on the spoils from the bears’ activity. 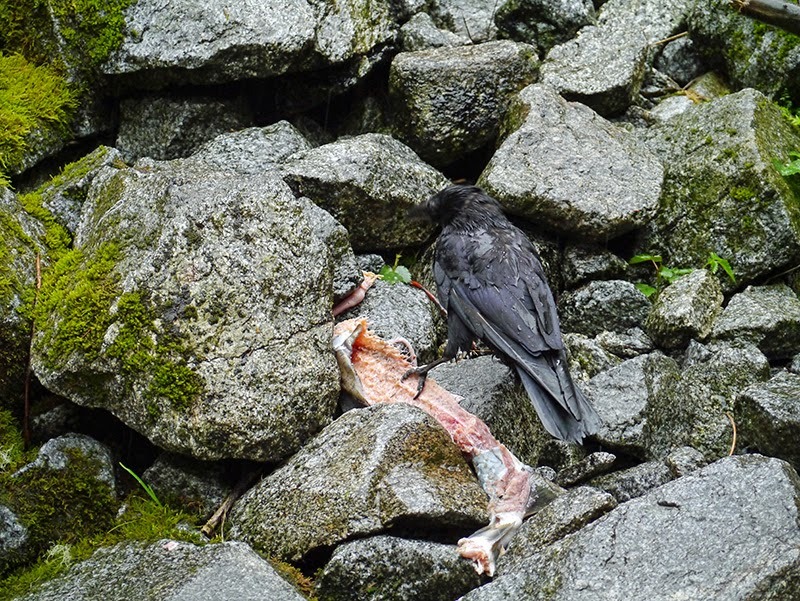 What is left after the birds have fed goes back into the forest, to fertilize and nurture the cedar and spruce trees, on or under whose branches, all these creatures live. 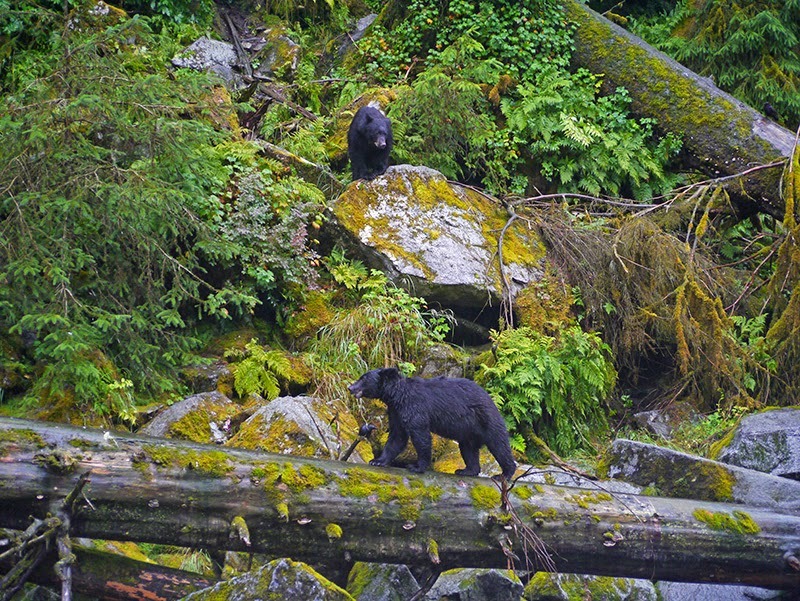 We had an unforgettable experience bear watching at Anan Creek. The next day, we moved down Seward Passage towards Ernest Sound. We made it about ten miles. 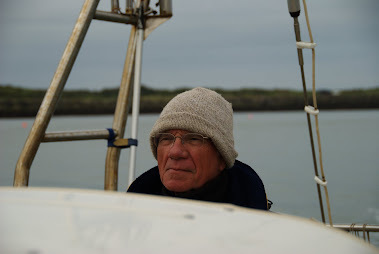 The weather continually deteriorated after we got underway, and we suddenly found ourselves in 24-knot winds with zero visibility and driving rain. We were in a narrow channel among small islets and fishing boats. After discussing it, we decided to anchor up instead of continuing on. Sunny Bay, a bight with suitable anchorage, was near at hand. Once we got anchored, we listened to an updated weather report: The forecast for Clarence Strait (which Ernest Sound opens onto) was 30 knots of wind with gusts to 50 in the northern half. 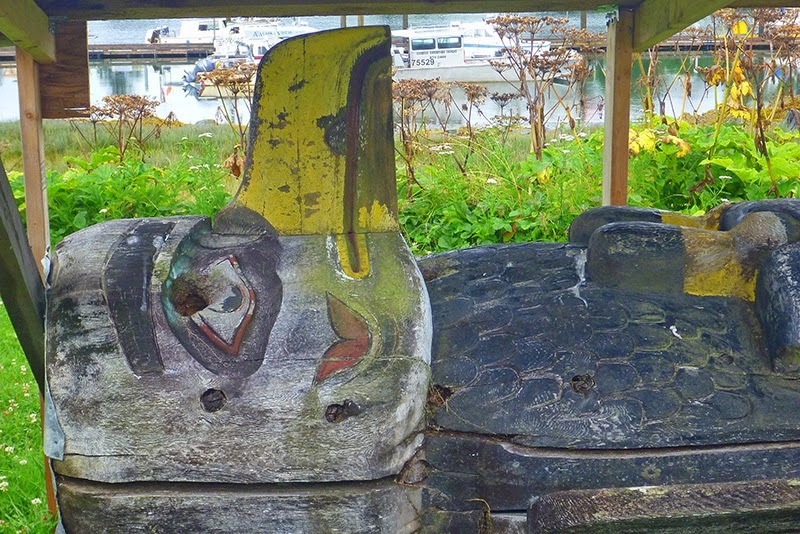 We might have handled this just fine once we got out of Seward Passage into a more open waterway. However, after five or six days of traveling in the rain, it just wasn’t fun to suddenly find ourselves in squall conditions. 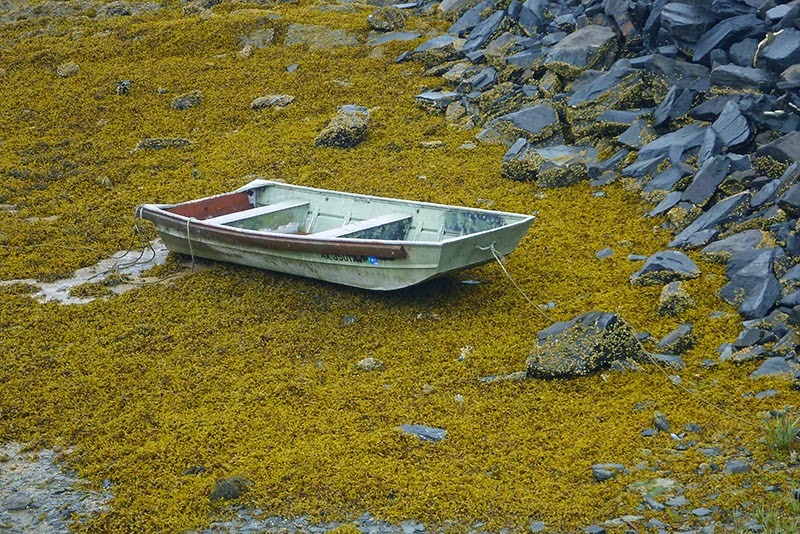 The advantage of coastal cruising is that you don’t have to go on in those conditions: You can just stop. And that’s what we chose to do. The wind stopped before the rain, and by evening, the rain had started to clear. 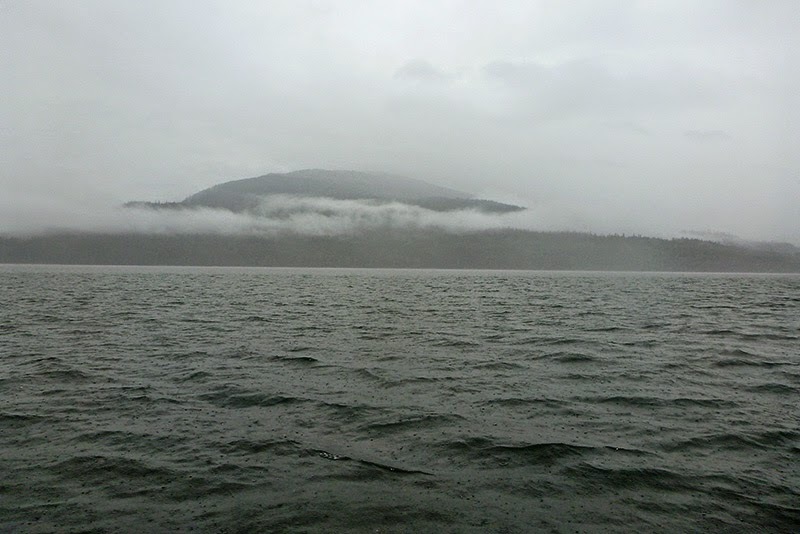 The next morning, we entered Ernest Sound in calm conditions. The Banana Belt was finally starting to live up to its name, as the sun broke through, and we shed layers of our clothing. We stopped to fish near a pinnacle where Patrick had successfully caught lingcod and halibut before. 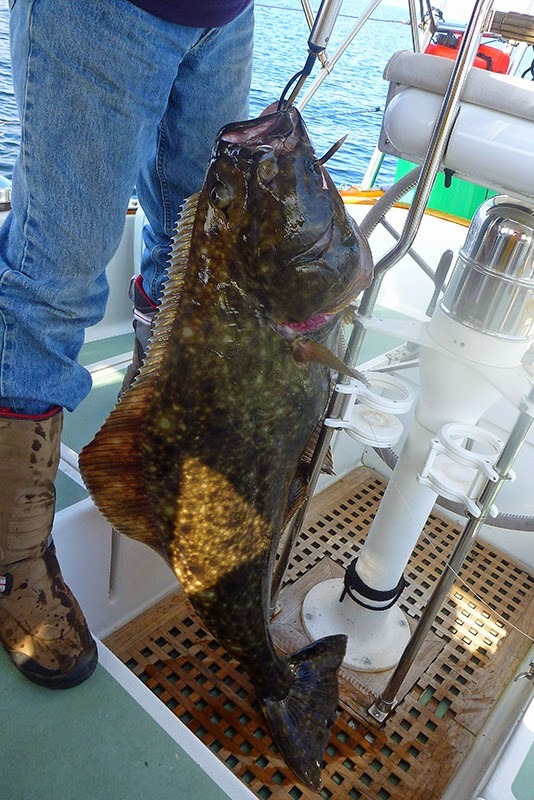 We hooked a large (50-60 lb) halibut and brought it onboard! Normally, we would have released a fish that big: It was much more fish than we could use or store without a freezer. However, we were heading into Thorne Bay on Prince of Wales Island, and we felt certain we could give some of the fish away. 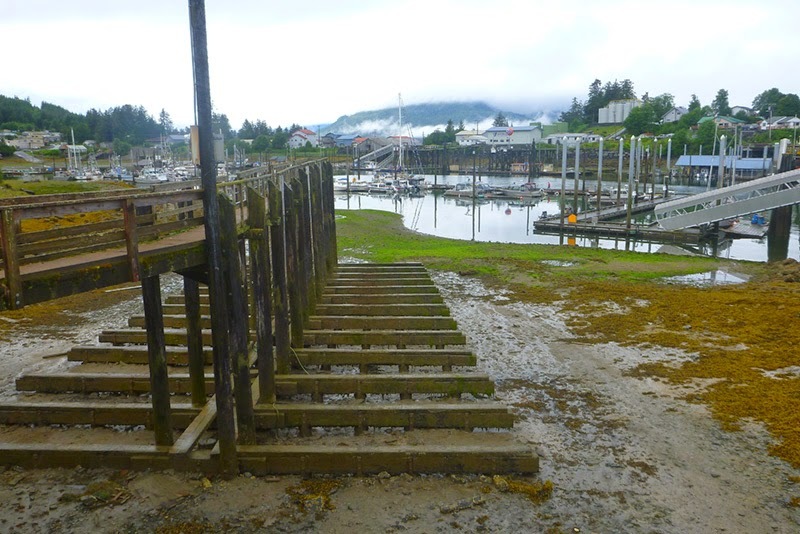 We had decided to go into Thorne Bay on Prince of Wales in order to avoid the cruise ship crowds at Ketchikan. Overall, it was a good call. Thorne Bay was an exceedingly friendly, welcoming community, and they had all the amenities that cruisers need with the exception of a Laundromat. And when you think about it, putting off doing laundry is not that much of a drawback! After getting a spot on the dock in Thorne Bay, we lugged our big halibut up to one of the fish cleaning tables that are common in Southeast. In exchange for a lesson on how to clean a halibut (we’d no idea how to approach cleaning such a large fish), we gave a local man half of our fish. He, in turn, shared it with some charter boat clients who had only caught salmon that day. Everyone at the table left with a chunk of halibut and was very happy. We weren’t the only ones giving away fish though---a couple of liveaboards from Mukilteo (near Seattle), now living in Thorne Bay, brought us some chum salmon and silverjack, still warm from their smoker! We brought them some halibut in return. Under sunny skies and with a larder full of halibut and salmon, we felt twice-blessed.